A quantum-mechanics-based simulation demonstrates how a new NIST instrument can delicately pull a chain of atoms apart. The chart records quantum jumps in conductivity as a gold contact is stretched 0.6 nanometer. 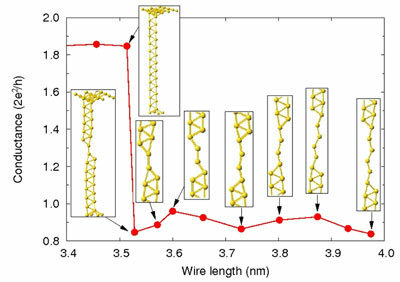 The junction transitions from a 2-dimensional structure to a one-dimensional single-atom chain, with a corresponding drop in conductivity. Following the last point, at a wire length of 3.97 nm, the chain broke. * The answer, calculated from atomic models, should be something under 2 nanonewtons, or less than 0.000 000 007 ounces of force. ** D.T. Smith, J.R. Pratt, F. Tavazza, L.E. Levine and A.M. Chaka. An ultra-stable platform for the study of single-atom chains. J. Appl. Phys., in press, March, 2010.